What’s better than a great big ball of yarn, and a trip to the big city?! 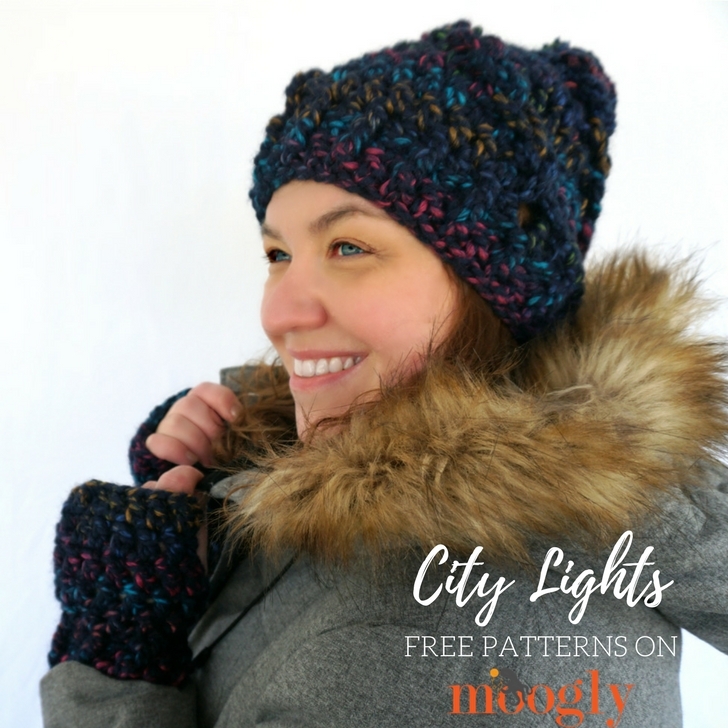 Making a set to wear there – the City Lights Hat and Mitts Set! 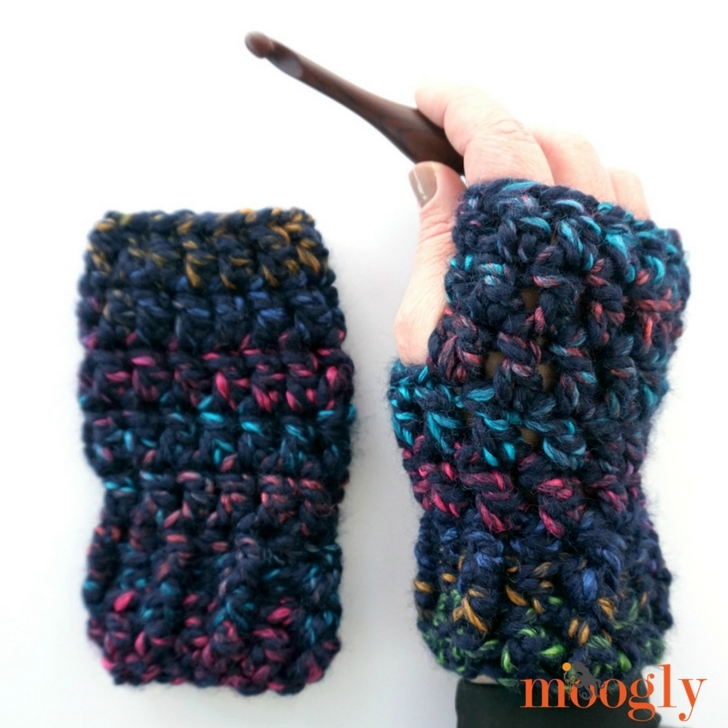 Both free patterns, right here on Moogly! 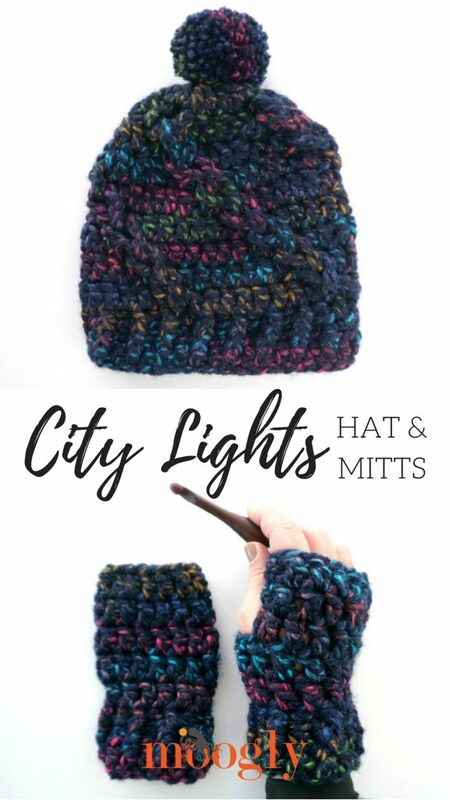 I’m heading to New York for a fun/business trip next month, so I wanted to make a new crochet hat and matching mitts – and when I saw Lion Brand Wool-Ease Thick & Quick Bonus Bundles in the City Lights colorway, it was practically fate! 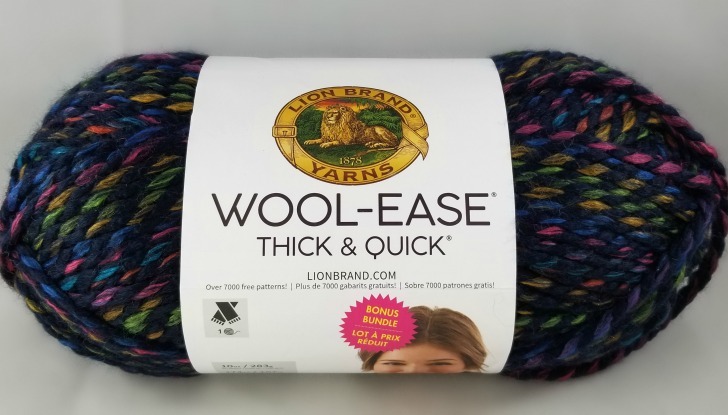 But you don’t have to travel to New York for this yarn – you can get it at over 800 Michaels stores, Michaels.com, and Lion Brand.com! 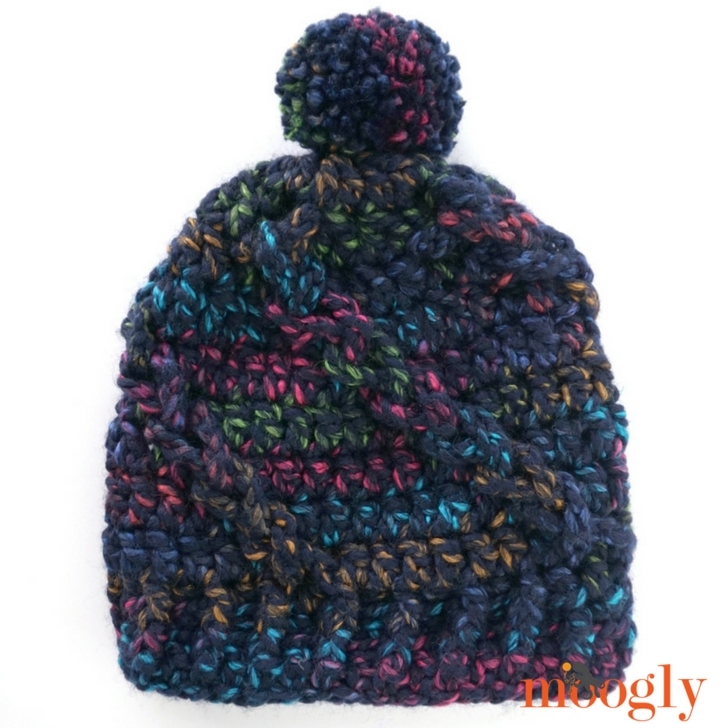 With the Wool-Ease Thick & Quick Bonus Bundle, you get enough yarn to make this hat and mitts set with just one ball – or you can use two balls of the standard size! Either way, this super bulky set will work up super fast. 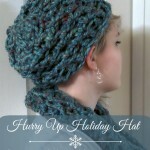 The hat has some fun loops to add texture and keep it interesting, while the mitts are quick, easy, and cozy! Hold all ch-10 loops to the front and work tr sts behind them. If desired, substitute a Chainless Starting Double Crochet for the “ch 3 (counts as first dc)” when indicated. Rnd 12: Ch 2 and dc in next st (counts as first dc2tog), dc2tog around; join and break yarn leaving a long tail. Use the tail to gather the crown closed (see linked tutorial above). 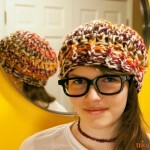 (8 sts) Add pom pom if desired. Rnd 13: Ch 2 and dc in next st (counts as first dc2tog), dc2tog around; join and break yarn leaving a long tail. Use the tail to gather the crown closed (see linked tutorial above). (10 sts) Add pom pom if desired. 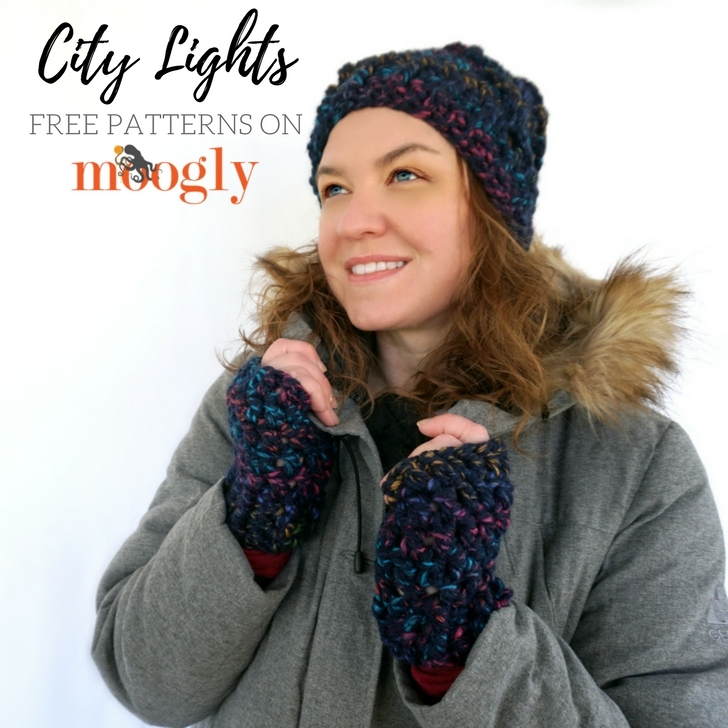 I just love the colors of the City Lights Set – such a fun colorway! And I also love that it took just one Bonus Bundle to make the entire set! Thank you! This is exactly what I was hoping to find today! My kids walked to the store by themselves and spent their own money to buy me some yarn for Christmas❤️. 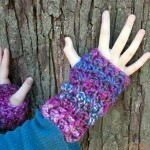 I needed a special pattern for this special yarn! You never disappoint! ♥ How wonderful! What great kids – happy new year Steph (and family)! Hi! I’m working up this pattern right now. 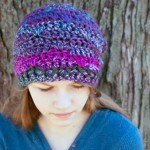 I have a question about rnd 4 on the small hat size. Can I post my question here?? Hi Selina! Please do! 🙂 I’d be happy to try to help! I’m just not sure if I’m going in to the right stitch for the dc after the tr in the row below. You would skip the stitch behind the tr and go to the next st for the dc – does that make sense? I think I got it! I put a faux fur pom on it and have gotten so many compliments. Thank you for this pattern and yarn suggestion! 😀 I’m so glad to hear it, thank you Selina!